This guide shows you how to add rubrics to courses, how to link them with various types of coursework, and how to use them to grade that work. You can create a new rubric just for your course or duplicate one of your school's global rubrics. Go to the course Rubrics view. Choose whether to add a new rubric or duplicate an existing one. If you're adding a new rubric, follow the instructions in this article. You can duplicate global rubrics or a rubric you've already added to this course. Check the radio buttons next to the rubric you'd like to duplicate. If need be, change the rubric's name. Now that you've added this rubric, you can start adding it to assignments and coursework; you can also modify it and its criteria, if necessary. You can add rubrics to any assignment (except test- and attendance-type assignments). Peer review assignments let you add rubrics only after you enable certain grading options. These will all be covered, below. When creating the assignment in the course Assignments view, you can select a global or course rubric for the following assignment types: grade-only, file, discussion, and essay. You can add a rubric to an existing assignment (of one of the above types) on the assignment's page. Click edit next to Info and select a rubric in the dialog box. The discussion must be a graded discussion. In the discussion settings, click Grade Comments or Grade Replies. You can select a rubric below the points field. When you edit the peer review assignment's info, you can select peer grading and other options. To allow students to use the rubric to grade one another's submissions, check Peer Grading and select a rubric for Submissions. If you do not enable peer grading, only you can use the rubric to grade student submissions. 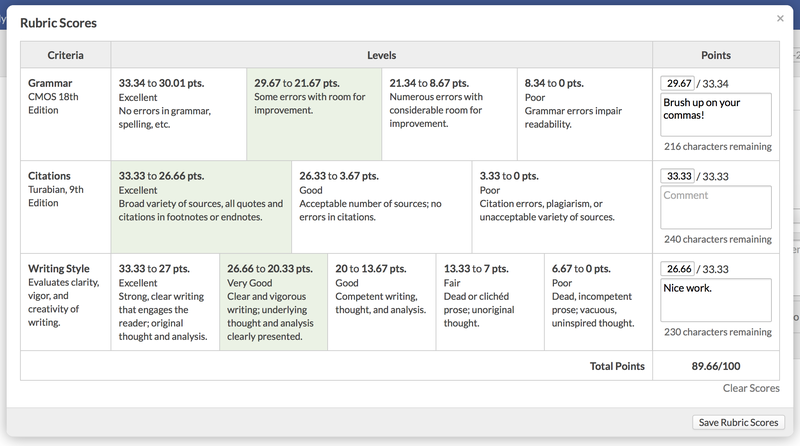 Select a rubric for Reviews so you can use it to grade student reviews. On the main assignment page. On the individual student assignment view. On the student course summary Assignments view. 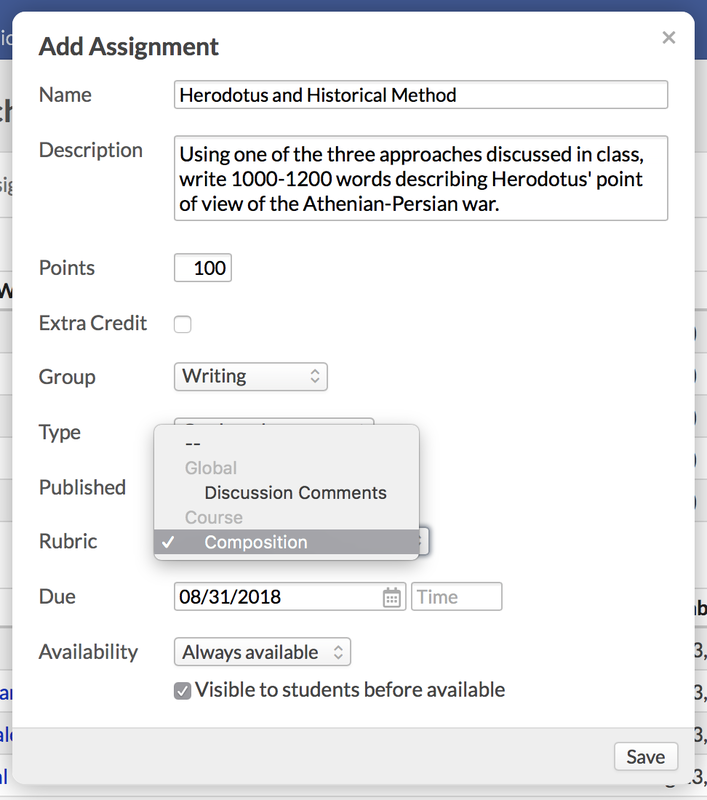 If you're using a rubric for a discussion, you'll see it in the Enter Grades interface for discussion comments/replies. If you're using a rubric for a peer-review assignment, you can use it to grade the student's submission (and if you've enabled peer grading, your students can use it, too). In any place where you can enter assignment grades, click Enter grades. In regular assignments, click to open the rubric scoring dialog. In peer review assignments and graded discussions, click Enter grades. Click the criterion level with the appropriate score/evaluation. This autofills the scoring field. Enter a number in the scoring field. This highlights the corresponding criterion level. Enter a comment under each criterion score (optional). When you're done, click Save Rubric Scores. The student's assignment grade will reflect the rubric score as appropriate (discussion and peer review scores will be factored into the grade calculation). You can view/edit the student's rubric by clicking . You will no longer be able to edit the rubric or the criteria that you used to score the student's work. You will only be able to duplicate the rubric and edit the new version. What will the student see? Once the rubric score/assignment grade is saved, the student can see her evaluation on the assignment, discussion, or submission page. Is this live now? I don't see any of this when I edit my assignments. ? I had no trouble creating a rubric. I just don't see anywhere to link it to an assignment. Christopher — yup, it's live! Make sure you've published the rubric. If that doesn't work, open a support request with the particulars so we can take a look. Ah yes...that might be the issue. Is there a way to take points off outside the rubric? For instance, what if the assignment is late which results in some points being deducted and this point deduction is not built into the grading rubric. I notice that once I use the rubric to score a student's work, save the grade in the rubric, go back to the student's assignment page, adjust the score for being turned in late, write a comment in the box about that, and save again. At that point, the rubric is no longer viewable to the student. Only the comment and grade changed outside the rubric. I have the same question as Marc above... It would be very helpful if there were a way to deduct points in the rubric for a late submission or other deductions per school policies. Any chance of this? The criterion would have two levels, one worth 0%, the other worth 100%. That way if the student turns it in on time, he gets 100%; if not, he gets 0%. The only hang-up would be if your policy is to deduct a whole number of points for late work (as opposed to a percentage). Brendan, our policy is to deduct a whole number of points for late assignments, so a workaround centered on points is needed for this issue. Is there a way to make the rubric dialog box moveable when using it to grade student work? Currently, when I open the rubric scoring dialog to enter grades, it blocks my view of any work that the student has uploaded for the assignment, and I'm unable to review their work and enter grades along the way. I'd like to be able to slide the rubric dialog to the side so uploaded work is visible along with the rubric. Is there a workaround to this issue? Thanks!